All the useful information that you need to know before sending money with Xendpay! Founded in the year 2011 under RationalFX, which initially provides foreign exchange and wire transfer, Xendpay aims to cut down the expenses of money transfer. It is a UK-based company which offers services in 205 countries in 51 currencies with more than 2968 currency pairs. Xendpay is a PSD agent and registered with the Information Commissioner’s Office under the Data Protection Act, 2018. The company offer both personal and business transfers, where it has launched “Pay What You Want” model of the fee. Here the fee applies on personal transfers is up to £2,000 per annum or its equivalent in other currencies. For the increased limit of business transfer, the rate is up to £4,000 per annum. Under this feature, Xendpay suggests currency exchange fees, where you ultimately decide how much you pay. Once you have exceeded these limits, you have to start paying nominal fees. Xendpay has been providing customer assistance to its users in the business hours in various countries, according to their timings. It does not offer 24*7 customer assistance to the users. Pricing : How much does Xendpay cost? Xendpay has a unique feature of “Pay What You Want” for its users. Here they can pay up to £2,000 per annum or its equivalent in other currencies for free. Above that, it charges a low transfer fee depending on the currency and country you are sending funds to. In most of the cases, the fee is in between 0.45% to 1.40% of the total amount. While in the business transfers, clients can pay up to £4,000 per annum. Above it, they have to pay the nominal fee, as asked by the company. The exchange rates offered by Xendpay is tended to be stronger than most of the banks and other money remittance companies. If the clients are sending money to any mobile wallet, then they have to pay a higher fee which also includes the delivery fees other than a transfer fee. If the payment is made through credit card, then you have to pay 1.7% fee if you are in Europe and 2.6% from other parts of the world. However, the debit card payments are free in Europe, while cost 2.6% in rest of the world. Xendpay scores 7 out of 10 from Exchange Rate IQ as it is not one of the cheapest options available and also does not offer any promo codes to its users. Transparency: Does Xendpay have any hidden fees? Once you enter the amount in your currency, Xendpay will change it in the currency you want to send to, without any hidden fee. It will also provide the details of the fees that you need to pay while doing the transfer once you choose the sending option. Xendpay provides notification for every stage of the transfer through email. You will receive the notifications when Xendpay receives the money and also when the funds are delivered to the recipient. Besides this, one cannot cancel the orders once placed unless you contact the customer care before the end of one business day. As per experts of Exchange Rate IQ, Xendpay has no hidden fee and excellent tracking procedure but does not provide on-click cancellations; therefore, it deserves 7 out of 10 in this head. Transfer Speed: How long does it take to send money through Xendpay? The time by which the recipient has received money varies on Xendpay. It all depends on the mode of payment as well as currency and country you are paying money to. Generally, Euro (EUR), Great Britain Pound (GBP), and the United States Dollar (USD) are sent to the recipient on the same day, except in the case of the weekend. If the payment is made after 2 PM British Time, then it is possible that the banks will not process on the same day. So, the recipient will receive the money on the next working day. In other currencies and countries, the recipient will receive the amount in 3-5 working days, depending on the working hours of the countries as well as banks. This is a long time, and therefore, Exchange Rate IQ provides it 6 out of 10 rating. Security : Is Xendpay Safe? Cybersecurity is one of the most important features of the online remittance service providers. Similar is Xendpay, which is using the same technology and security as online banking systems. It acts as an agent to RationalFX, which is regulated by the UK Financial Conduct Authority (FCA). It is also registered with Her Majesty’s Revenue and Customs (HMRC). It uses secure web site protocol called SSL as a server. If anyone is making the card payment, then all the security code and password are hidden, encrypted and not visible to Xendpay. RationalFX has also appointed Money Laundering Reporting Officer (MLRO). All this security is good, but it has not been providing any physical security, so that we will rate 8 out of 10 to Xendpay. Its pay what you want option. It has been highly secured which includes 256-bit SSL encryption with a 2048-bit signature. No android app is available. Very limited payment and delivery options. With Xendpay Money Transfer, one can send money from the debit card, credit card, and bank account. It also supports SOFORT payments in some of the countries. It does not accept crypto currencies, money market instruments and SWIFT transfers. One can send money from $1 to $9,000 before verification. After verification, one can send up to $100,000 yearly. Besides all this, the company has been offering its website in five different languages. This includes English, French, German, Spanish and Polish. It offers personal and business transfers but not charity, where it can expand its business growth. On overall user experience, Exchange Rate IQ’s experts rate Xendpay 8 out of 10. So, if you are looking for transferring money through Xendpay login here. Coverage: How many Countries & Currencies does Xendpay support? With Xendpay, one can transfer to 205 countries in 51 currencies which also include Nigeria, Kenya and the Philippines. One can send money through the bank account, cards or directly to the mobile wallet. The company is covering many countries of Asia, Europe and the Americas, but not of Africa. So it has still many countries to cover where it can grow and provide its services worldwide. Hence, we provide 8 out of 10 for its currency and countries coverage. Using Xendpay for over a year now. Great service indeed and recently their rates have gone better as well as transaction charges. Fast money transfer. Highly recommended. J'ai ouvert un compte avec "patience" après quelques allers et retours. Je m'y attendais puisque j'avais fort heureusement lu pas mal d'avis ça et là concernant ces nouvelles plateformes. Une fois prêt j'ai tout d'abord voulu tester un premier virement à l'international (1000 Eur à convertir en USD). Je complète la transaction normalement et quelques jours plus tard, je constate des frais de 35 USD (différence entre le montant converti et le montant reçu ; plus de 3%) ... et c'est là que mon marathon commence. Je demande des explications et j'obtiens des réponses confuses malgré la copie du swift détaillé qui ne fait ressortir que des frais split de 3,25 USD, loin des 35 USD. D'autant plus que mon interlocuteur (un collaborateur de RationalFX) me dit que ces frais split sont pris en charge. En tout cas, personne n'a été capable de me fournir un document faisant ressortir ces frais, ni me fournir une explication plausible. Aujourd'hui, toute communication est rompu; aucun des contacts avec qui j'ai échangé ne répond à mes emails (plusieurs personnes se disant 'spécialistes des marchés' chez RationalFX, la maison mère de Xendpay, mais incapables de justifier ces frais). Cela est d'autant plus dérangeant car je ne peux même pas savoir ce qui se passerait si je voulais envoyer une grosse somme... En résumé, service trop opaque, pas de réponse de personnes aimables au début pour appâter le client et irrespectueux ensuite au point de ne pas répondre aux messages et demandes de justifications. Excellent fast service, no hassle and great exchange rates!!!! I was a little bit nervous when I used Xendpays service to transfer CNY to my debit card in China from my German Euro bank account for the first time. It worked perfect and quickly at a good exchange ratio. The fee is normal (same as German Sparkasse; but the Sparkasse can only transfer Euro to China and you have to go to a bank office in China to change into CNY). I will use this service again. All transactions sent recently have been dealt with promptly . Funds sent overseas. Requests have been dealt with promptly Funds have been delivered with no apparent hitches. Thank you Team for a professional service. I shall use you again. Payment time can be reduced, it took me 2-3 days, rest all went well like registration is simple. Not happy as the minimum charge has increased by 350%. This is shameful. So far my experience with XendPay has been satisfactory. They transfer as soon as they receive the amount. Customer support also responds well. It would be really nice if they could have Android App so that it becomes more accessible on the go. Glad Påsk!!! 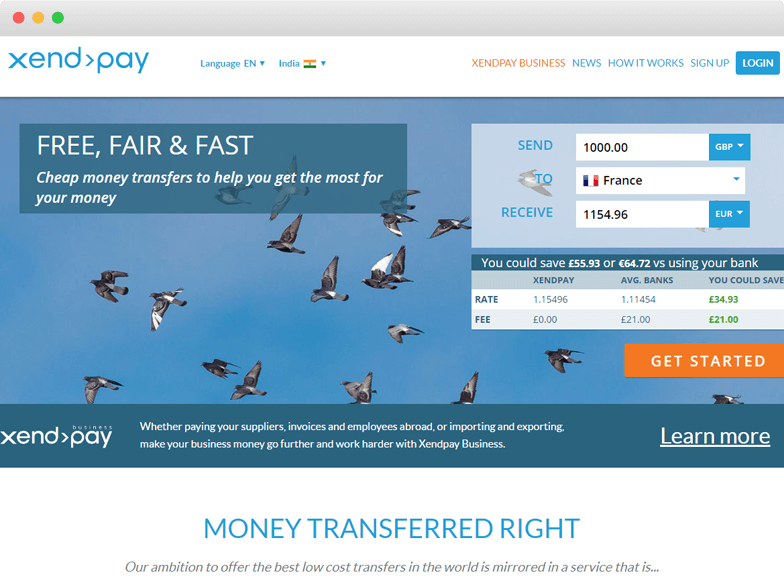 Very very good site to transfer money, with fast and reliable service..
Go to the website of Xendpay. In the mid of the home page, you will find “Send Money Now”. Here if you are an existing user, log in. If you are a new user, then sign up. After signing up, enter all the personal details. Select the type of account personal or business. Enter the bank account or any card details. Re-check all the details and make the payment. Track the details of your transfer on the dashboard.